History writing has long been preoccupied with manifestations of difference as well as different manifestations of historical processes in far removed regions. To go a step further, one of the great promises of Global History as a sub-discipline has been the incorporation and analysis of seemingly disparate phenomena as integral parts of a single history. 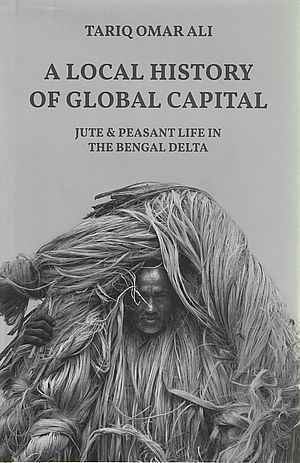 In the title of his first monograph – „A Local History of Global Capital: Jute and Peasant Life in the Bengal Delta“ – Tariq Omar Ali has signaled his intention of weaving one such story. All the prerequisites for this exercise are in stock. To begin with, the story of jute in Bengal was intricately connected with Scotland and particularly with Dundee. While raw materials for the Scottish jute industry were supplied exclusively from Eastern Bengal (the region on which Ali’s study is focused), towards the end of the 19th century the rapid increase of jute mills in and around Calcutta was also in huge part driven by Dundonian know-how and capital investment (a process made popular by global capitalism in the late 20th century under the caption of outsourcing). Further and perhaps even more importantly, jute was one of the special commodities whose production further facilitated global trade. As a main means for packaging and transporting various other commodities, Bengal’s monopoly over raw jute was both essential for smooth trade as well as a subject to fluctuations in commodity flows around the world. Finally, it should be noted that some of the foundational historiography in South Asia, e.g. in labor and gender but also – importantly for the study at hand – peasant history has been devoted to the jute economy of Bengal. Bearing these favorable preconditions in mind, Local History of Global Capital regrettably fails to deliver on its main title and is only partially successful in executing on its subtitle. At best, Ali has written a social history of jute tracts in which the „global“ and the „local“ remain worlds apart. At worst, despite the author’s self-avowed aversion to coarse economic history and desire for „critiques of neoliberal global capital“ (p. 198), the single point of interaction between the two entities remains the commodity market. The book is divided into seven chapters, preceded by an introduction and completed with a rather short conclusion. The chapters follow a rough chronological order from ca. 1860 to ca. 1960, trailing the historic rise and fall of jute as an economic determinant in the region. The broad strokes of the story are well known. The initial entrance of jute in the global market was brought about by the interruption of trade with other fiber crops in the context of the Crimean War. The acreage of cultivated land under jute in Bengal grew some 80-fold (!) between 1850 and its historic high in 1906. This initial period of growth (itself punctured by peaks and depressions) was followed by a period of stagnation and decline of the jute cultivation, the crop itself, however, remaining of utmost importance for the agrarian economy in the first half of the 20th century. Jute gave way to other strategies and crops only in the wake of partition when the Bengal economy was disentangled by the newly formed states of India and Pakistan. Jute brought both prosperity and poverty to the region. Ali shows that peasants were willing to risk (and de facto introduce) hunger to their household planning for the promise and occasional realization of affluence (chapter 1). The latter was manifested through a wider consumer basket, a pattern which Ali has referred to as the „self-fashioning“ of farmers by means of consumption (chapter 2). The period of plenty was followed by the proverbial lean years, in this case referred by the author as „peasant immiseration“ (chapter 4). Meanwhile, the political landscape of the region was also forcefully transformed. Communal divisions – provoked famously by the Viceroy Curzon’s plan to partition Bengal in 1905 and overcome by the Swadeshi movement with a formal re-unification taking place in 1911 – found various political and sometimes violent expressions in the 1920s and 30s and culminated formally in the formation of separate states in 1947. Ali’s book excels in showing the demographic geography and political transformations of the region in the first half of the 20th century. The dichotomy urban (Calcutta)/rural (cultivators) is shown to be harshly superficial as the author reveals the formation of market towns related to jute trade routes along river deltas and railroads and associated with the formation of a new class of Muslim intelligentsia (chapter 3). As franchise gradually grew, new political visions, e.g. „agrarian Islam“, and parties came into existence (chapter 5). These could not always live up to the promises they have made in the heat of competition for power, case in point being the short-lived Krishak Praja Party, dominant in jute tracts in the election of 1937 with a promise of „rice and dal for everyone“ (chapter 6). After surviving the Bengal Famine (1943), jute cultivators soon found themselves subjected to the economic reasoning of the Pakistani state concerned with curbing smuggling of raw jute (as noted mills were concentrated around Calcutta) and viewing the fiber cash crop as a national resource (chapter 7). All themes and analysis are accommodated in 198 pages – a feat rendered impossible by the repetitive style of the book. Apart from an extended outline in the introduction, every chapter has its own overview and conclusion, reiterating often tautologically not only arguments but also descriptive elements of the narrative. To give one example – the propensity of Bengali farmers to buy and eat luxury/gourmet fish is mentioned at least a dozen times in the book. The most substantial deficiency of the book, however, is its highly selective engagement with the secondary literature. Early in the book the author expresses his willingness to redress „economistic images of peasants as profit-driven automatons responding to fluctuations in prices“ (p. 36). The reader unfortunately remains in the dark as to the origin of such „economistic images“. Indeed, Ali leaves the impression that omissions are not accidental but rather that he had purposefully decided to turn his back on existing literature and debates that directly address many of the monograph’s themes. One feels, for example, that based on the existing primary sources the book could have significantly benefited from a short comparison to other cash crop regions in colonial India, where fluctuations in the price ratio between cash crop and staple food have also meant sporadic hunger. Ali’s initial excursion into global history similarly raises more questions than it cares to answer (p. 8) – why were Ghanaian cocoa farmers more successful in boycotting the sale of their crop or – to put it differently – why were Bengali jute cultivators seemingly price takers (again the region had monopoly over the production of the crop)? What can we learn about information asymmetries and/or colonial economic endeavors? The omission of the somewhat dated but still reference work of M. Mufakharul Islam on the agriculture of Bengal in the interwar period is in this regard simply inexplicable. The issue unfortunately reaches deeper levels as even ideas and works of classical economics are willfully disregarded. The fish repetition, for example, begs the question whether one can think of conspicuous consumption in the context of an agrarian economy (an issue topical for post-colonial and global history as it has been discussed in different guises by the likes of Franz Fanon and Immanuel Wallerstein). Which brings us to a final conspicuous absence. Ali gleefully rejects Marxian analysis refusing the „abstract category of labor“ (it is unclear whether the category of abstract labor is meant, p. 9) in favor of a more practical description of transformation of rhythms of work and leisure or, more dramatically, „of corporeal peasant bodies laboring on soil and in water“ (p. 36). Further, the author refers to Dipesh Chakrabarty’s notions of History 1 and History 2 to set the theoretical framework accommodating „communities not subsumed by capital“ (p.10). Considering the imperatives of capitalism as translated into the contemporary academic labor market, such second-hand lampooning of Marx seems to be a well calculated risk worth taking. The reader of Local History of Global Capital, however, is left to wonder on what exactly the future and, according to Ali, necessary „critiques of neoliberal global capital“ will be based. Jim Tomlinson, Dundee and the empire. 'Juteopolis', 1850–1939. Edinburgh 2014. Dipesh Chakrabarty, Rethinking working-class history. Bengal, 1890 to 1940. Princeton 1989. Samita Sen, Women and labour in late colonial India. The Bengal jute industry. Cambridge 1999. Omkar Goswami, Industry, trade and Peasant Society: The jute economy of Eastern India, 1900–1947. Delhi 1991. M. Mufakharul Islam, Bengal agriculture 1920–1946. A quantitative study. Cambridge 1978. Nikolay Kamenov: Rezension zu: Ali, Tariq Omar: A Local History of Global Capital. Jute and Peasant Life in the Bengal Delta. Princeton 2018 , in: H-Soz-Kult, 18.03.2019, <www.hsozkult.de/publicationreview/id/rezbuecher-29755>.